Essential Fatty Acids are crucial to the maintenance and support of our bodies, but since our bodies don't produce them, the only source of Essential Fatty Acids is through the foods we eat, usually fish and oils. It can be difficult to get enough fatty acids, especially with today's low-fat diets. 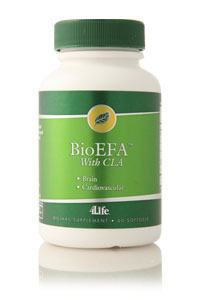 BioEFA with CLA is formulated with fish oil, borage seed oil, flaxseed oil and CLA (Conjugated Linoleic Acid). Borage seed oil, fish oil and flaxseed are excellent sources of omega-3 and omega-6 fatty acids. Conjugated Linoleic Acid has recently been shown to be an important nutrient in promoting muscle tone and reducing body fat. It is naturally found in some meats and dairy products, like cheese. However, due to technological advances in the way animals are raised for food, the amount of CLA available in these foods is significantly reduced, up to 80 percent less than it was just 20 years ago. BioEFA with CLA Includes quality sources of both omega 6 and omega 3 fatty acids for a well-rounded more complete essential fatty acid product.